Remaining Ethiopians waiting to immigrate to Israel prepare for Passover. 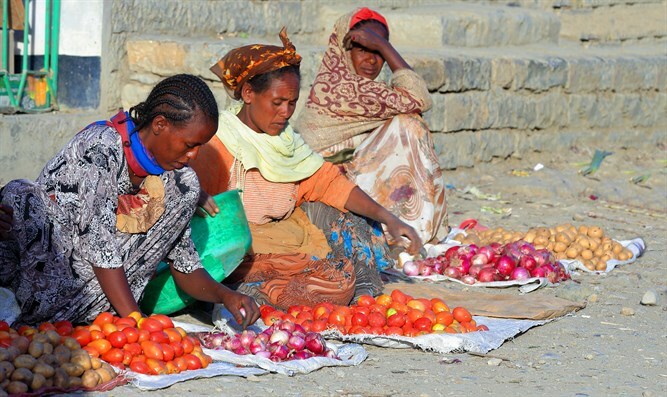 Many of the at least 8,000 remaining members of the Jewish community of Ethiopia awaiting Israeli government approval to move to the Jewish state will attend a Pesach (Passover) seder in Gondar or Addis Ababa. In preparation for the holiday, the Ethiopians have baked nearly 100,000 matzahs by hand, according to the Struggle for Ethiopian Aliyah, a nongovernmental organization. The process includes sifting the wheat, grinding the flour and baking the matzahs over an open flame. They also will prepare wine from raisins. About 4,000 members of the Jewish community are expected to attend the seder in Gondar. The aliyah of the Ethiopians who claim Jewish descent, known as Falash Mura, is uncertain after the Israeli government earlier this month passed the 2019 state budget with no allocation for Ethiopian immigration. The immigration and its funding reportedly is slated to be discussed at a future interministerial meeting; no date has been set. The Falash Mura claim links to descendants of Jews who converted to Christianity generations ago and now seek to return to Judaism. The Interior Ministry accepts them as immigrants under the Law of Return. In August, the government said it would bring 9,000 Falash Mura to Israel by the end of 2020. The Knesset in November 2015 had unanimously approved a plan to bring them over following a public campaign launched by the nation’s Ethiopian community and volunteer organizations. At the same time, it announced that it would be the last round of Ethiopian immigration. Many of those waiting to immigrate have family already in Israel. Some have been waiting for 20 years to come to Israel. The future immigrants live in Gondar and Addis Ababa. About 135,000 Ethiopian Jews live in Israel today. Some 22,000 Ethiopian Jews were airlifted to Israel during Operation Moses in 1984 and Operation Solomon in 1991.